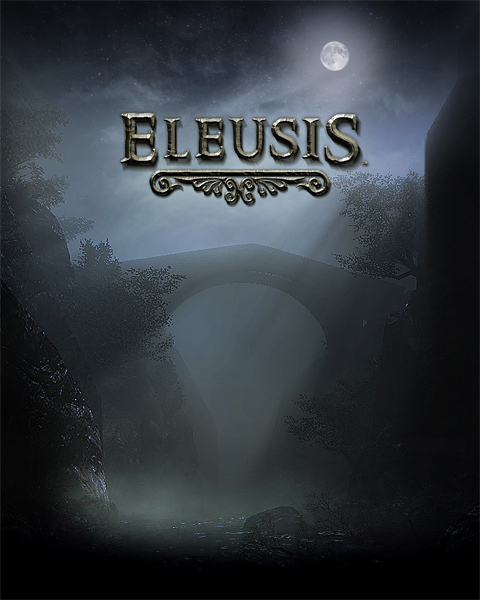 Eleusis is a 3d first-person adventure game for Windows developed by Nocturnal Works. It takes place in a seemingly abandoned village in Greece where the player character, while trying to seek refuge, finds himself in the center of a whirlwind of mysterious events. As the plot unfolds he finds clues that indicate that the village is a nest of a cult which plans to revive a dark force through an ancient ritual and harness its power. The player character faces the challenge of unlocking the forgotten knowledge of the ancient mysteries in order to stop the cult from accomplishing their goal. It is an exploration based adventure game where the player is called to solve the mystery by finding clues and reading various texts based on actual history, mythology and technology of ancient Greece. Eleusis version 1.3 adds six more languages along with an added option to turn off enemies and minor bug fixes. The new languages are French, Italian, German, Spanish, Polish and Russian. Also anyone who already purchased or will purchase Eleusis in the future from Desura will also get a free Steam key from the Desura page by following the below steps. 1. Log in on Desura. Owners of the BeMine 8 Groupees Bundle can obtain their key directly from Groupees. We are currently in the process of performing an update, which adds more options, fixes bugs and gives more hints to the player. Would you like Eleusis to be on Steam? We need your help! This is the standalone version of the Eleusis Demo. You can install this if you don't want to use the Desura client. I disliked the enemies. Disabled them, after I was insta-killed three times in a row by one. Graphics are impressive and really shows, what indie-games are capable of nowadays! Ummm.....my save game is a goner. Wondering if it might have to do with this recent update? when we can expect v1.3? Yea, can't wait for the german version to be released! We uploaded the version 1.3 and awaiting approval from Desura. The update is online. Perfect, and thanks for the great game (and the option to disable the enemies ;)). Just a quick question for the Eleusis devs. - Are there Steam keys to be made available to those who bought the Desura version? Cheers. Those who have purchased Eleusis via Desura will be able to get their Steam keys around next week directly from Desura. Cool atmosphere, I like the use of lighting in this game especially. The puzzles aren't bad either. -1 point for performance though. The village area is especially hitchy. RT @BeautiFunGames: Last hour and and a half to get Nihilumbra 70% off at @DailyRoyale Dailyroyale.com and also 25 hours left for @EleusisGame!Go for it!